Richard and I have been playing with flash cards as a way of learning things. The great thing about an electronic implementation of the old ‘question on one side, answer on the other’ idea, is that it can make smart decisions about when and how frequently you should be presented with a particular card. Things you find easy to remember need only occasional repetition, while those which are new or more challenging need more regular viewing until they stick in your memory. When you see the answer, you just say whether or not you got it right, and how hard you found it. Richard wrote a little while back about using this model to learn a reading he had been asked to give at a wedding. I’ve always liked learning poetry or bits of Shakespeare, but often find that large chunks will flow easily while there are one or two lines I always forget. Could this be the solution? One of the popular flashcard systems out there is an Open Source one called Anki, created by Damien Elmes. It has Windows, Mac, Linux and Web clients, plus Android and iOS (though these don’t yet work on the latest version). And there are various ways you can get decks of cards in and out. The user interfaces are rather quirky, I find, and even the web sites can be confusing to navigate, but the underlying system works fine. 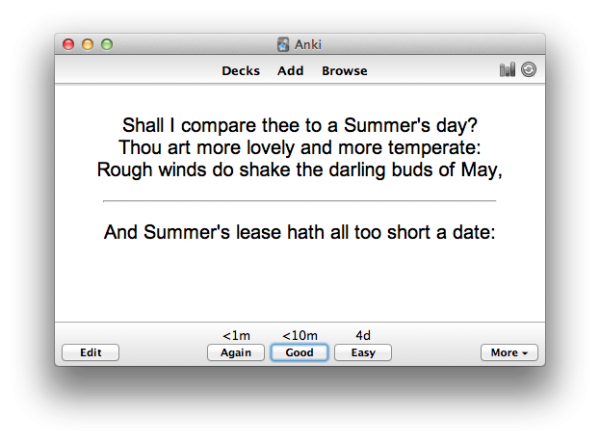 It’s easy to find plain-text versions online of most things I want to learn, so I wrote a little script called poem2anki which will take a text file containing lines of poetry (or prose!) and convert it into a file suitable for importing into Anki. It will create these for all the lines in the poem, but you’ll quickly find you’re only tested on the ones you find difficult to answer. You can find poem2anki here if wanted. I shoot almost all my photos in RAW format, which means that my important originals are in a variety of different formats: some Nikon, some Canon, some Panasonic. All of these are proprietary formats (though they’ve generally been reverse-engineered), and so not really ideal for long-term archiving. It was for this reason that Adobe, some time ago, came up with the DNG — Digital Negative — format: an open standard intended for things like archiving. There are tools for converting most things into DNG, and the idea is that you’ll always be able to get your images out. Some cameras even save DNG as their native format. It’s a very good idea. The problem is that almost none of the tools I use support it. Adobe Lightroom does, of course, and makes it nice and easy to convert images automatically as you import them from your camera. But, once I have my image as a DNG, I find I can’t open it in Aperture, Preview, Acorn or even Photoshop CS3. I don’t get thumbnails in the Finder. I tried reverting to earlier, less efficient versions of the DNG format with fewer fancy options but it still didn’t help, unless you go back to really early variants, which can multiply the file size by three. I could, of course, view my DNG files in Photoshop if I adopted the standard Adobe solution: pay hundreds of pounds to upgrade a product I paid hundreds of pounds for a little while ago. But I have the latest versions of other software products and none of them can open recent DNGs. 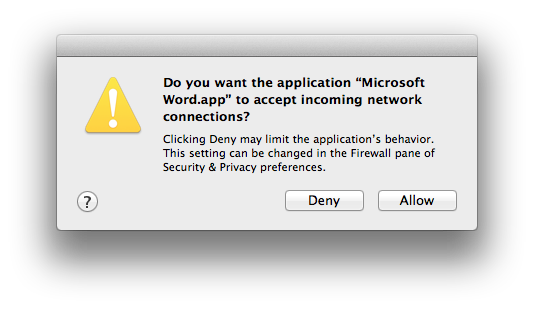 Some of it may boil down to insufficient support in Apple’s underlying libraries. Whatever the reason, everything can open the closed, proprietary formats, whereas even Adobe’s DNG Converter can only convert to other forms of DNG. A few special tools like RPP can convert them to TIFFs, as long as you’re not using the latest DNG variants. I’ve written about this before, but I repeat the experiment periodically to see if things have improved, because I really like the idea of storing things in an open raw format. But, sadly, at present, putting your files into DNG seems to imply locking yourself into expensive Adobe upgrades. This morning, as I was getting ready for breakfast, I was contemplating what must, surely, be one of the finest phrases in the English language. Not for its own intrinsic poetry, which I will grant you is minimal, nor indeed for the very pleasant experience it actually describes, but for all the additional images that it conjures up of comfort, safety, return from exciting adventures, and a sense that all is well with the world. Is there any other phrase that so encapsulates these ideals as the simple three words, hot buttered toast? Many thanks to Martin Kleppmann for the link. Tonight I gave a talk about the Raspberry Pi to the Cambridge and District Amateur Radio Club. I pointed out that I didn't really belong in the group, unless you stretch the word 'Amateur' almost to breaking point, for I know almost nothing about radio. But I understand the appeal. I made little crystal sets as a child and discovered that the aluminium double-glazing frame in my bedroom was an astonishingly good aerial, provided you wanted to listen to BBC Radio 2. Any other station was likely to be disappointing, but this it received so well that I could almost just connect high-impedance headphones to the frame without any other components. I read, with great jealousy, American novels where the kids had adventures involving walkie-talkies. Many years later, the opening up of CB radio and other bands here in the UK made such things a possibility, but for me, radio was something you received, not transmitted. On a couple of occasions, visiting a friend or distant family member, I was taken out to a 'shack' in the back garden and allowed to watch and even participate in the strange ritual of starting up shelves of valve–powered equipment, which existed to connect a little speaker and microphone, via an enormous roof-mounted antenna, to people in far-flung parts of the country or even, if atmospheric conditions were right, of the globe. What I realise now, of course, is what these guys were doing. These were the ones who weren't the passive consumers of radio technology like the rest of us. They had gone to the trouble to amass the equipment and expertise to be allowed to transmit as well as receive. And what were they doing with it? Late at night, decades before Mr Zuckerberg was even born, they were disappearing into their strange dens to engage in global social networking. The other revealing thing, for me, was that I only saw this message today, which means I haven’t used Microsoft Word for more than four months. This time, as is usually the case, I only need to run it when I’m sent something by a lawyer. Here’s a quick and unsolicited recommendation. When I first set up Telemarq, I was looking for some accounting software that I could use on my Mac, since MYOB, of which I was rather fond, is no longer in existence. I tried GnuCash, which is free, and now really quite good. I used Ledger for a bit, which is splendid if you’re a geek who likes everything in text files. Both of these gave me a lot of control, but they also swallowed a great deal of my time. Friends suggested I should look at cloud-based offerings, and after experimenting with a few I came across FreeAgent. I was, I must admit, rather hesitant about this. As a limited company, albeit a very small one, we needed to pay their top rate of £25/month plus VAT. A total of £360 per year. That’s quite a lot for accounting software in a small company. (If anyone decides to try it as a result of this post, please click this link and you might save me a few pennies!). In addition, I understood ‘real’ double-entry bookkeeping, and this hid a lot of that behind the scenes, so it couldn’t be a real accounts package, could it? Well, several months on, I just love it. It saves me a huge amount of time – much more than 30 quid’s worth per month, I suspect – does almost everything I need, and is very UK-oriented (so it tells me when my VAT returns and annual company returns are due). It produces nice invoices and send them to our clients, along with links for electronic payment options if they want to use them. It’s very good at importing my bank statements with minimal manual intervention, it makes submitting VAT returns a breeze, and on the rare occasions when I’ve contacted support, they’ve been very prompt and helpful. Finally, there’s a good API, and various apps for smartphones which make it really easy to log expenses and timesheets. There are some things I’d like changed: I wish the pricing was a bit more competitive for small companies, I wish they offered a low-cost ‘personal’ version because I’d like to use it on my own accounts, I’d like a few more options when configuring invoices… but all in all, it comes highly recommended. The male equivalent is probably buying a model railway set “for the benefit of your children”. Or, at least, it used to be. Now, of course, geeks of my generation are terribly keen to support the RaspberryPi, “because of all its educational benefits”.